Two titans of 21st-century jazz piano will join forces at the Walker’s McGuire Theater this Saturday. The audience is in for the rarest of treats: a meeting of equals that promises to break new ground even as it revisits shared history. 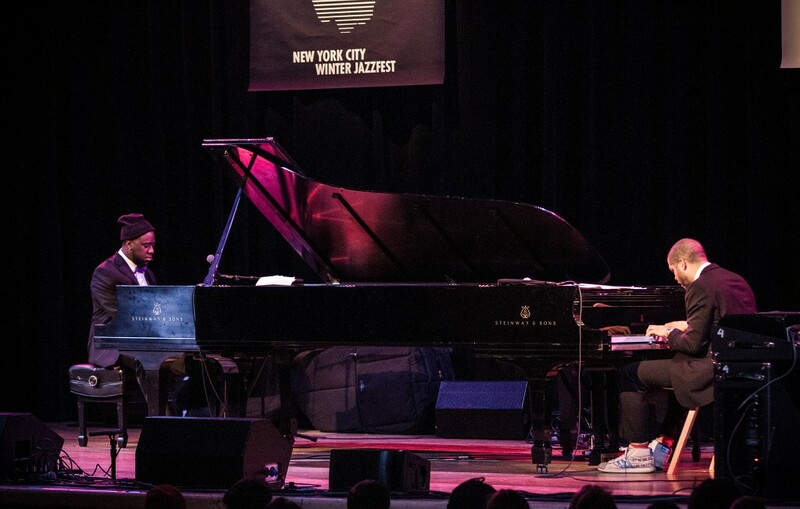 The commonalities between Jason Moran and Robert Glasper extend beyond their instrument. Both artists attended Houston’s High School for the Performing and Visual Arts, and they have both since refined distinctive languages characterized by an openness to a vast range of stylistic impulses. The breadth and depth of their respective visions would be impossible to encapsulate in a single playlist. What follows, then, is not intended as a representative selection, but as a freely associative dive into their multifarious artistry. In a playfully reflexive gesture, Moran heeds Piper’s suggestion to “break down” ideas by breaking down and rearranging her commentary itself. By rendering this rearrangement so transparent–we hear the unaltered source speech in its entirety later in the album–Moran alerts us to the constant deconstruction and reconstruction of meaning that characterizes his artistic process. Moran’s layered musical statement interacts with Piper’s original statement, and the resultant profusion of intertextual meaning invites the listener to take part in the interpretive fun. In the span of just three minutes, Moran has laid out an ambitious array of artistic aspirations: to make art that is both abstract and accessible and to ‘break down’ barriers between artist and audience, form and process, and language and music. Over the course of his career, Moran has done remarkably well on each of these fronts, garnering critical acclaim and an ever-expanding audience. Moran’s decision to mine Piper’s speech for its cadences and melodic contours as well as its semantic content points towards one of Jason’s early and ongoing influences: hip hop. The honeyed tones of this Q-Tip cut come from none other than Robert Glasper. Glasper has an extensive history of collaboration with pre-eminent hip-hop artists, and there are few rappers/producers more venerated than Q-Tip. A founding member of A Tribe Called Quest, Q-Tip also offers a link to a seminal time in the admixture of jazz and hip hop. Jason’s plangent playing here creates a wonderfully evocative atmosphere. The piano’s rich overtones seem to hover in the air, enveloping the listener in the bittersweet warmth of remembrance. Within the first 45 seconds of this track alone, we can hear traces from across the history of jazz piano: the rapid-fire barrages of Bud Powell, the left-hand stride patterns of the early pioneers, and the joyous, jagged dissonances of Thelonious Monk, who composed the tune. More than a simple homage to his forebears, the voice that emerges is unmistakably Glasper’s own. The trio’s take on the song has a playful persistence to it, dancing around the theme again and again until it explodes into something rapturous. Monk’s music is a touchstone for both Glasper and Moran, as is the music of the early stride piano masters, but they share a preference for addressing these legacies obliquely rather than as linear influences. This swinging jaunt from celebrated AACM (Association for the Advancement of Creative Musicians) pianists Muhal Richard Abrams and Amina Claudine Myers showcases the piano duo format at its finest. The melodic thread holding the piece together seems to be a single motif that sounds vaguely like an inversion of Thelonious Monk’s “Epistrophy.” From that germinal material, Myers and Abrams pull and push against one another, spinning the idea through every wondrous permutation imaginable. Here, Moran and Glasper fulfill the tremendous promise of their collaboration. Their interplay sounds comfortable but not complacent. It’s a pleasure to hear them alternate between digging into their shared vocabulary and pushing each other to new heights. The two artists make use of the full spectrum of pianistic possibilities, shifting from comping to soloing, from rhythmic ideas to lyrical ones, all fluidly and seemingly effortlessly. Moran composed the tune they are playing, or, more precisely, arranged it; “Retrograde” is the product of his experiments with playing “Smoke Stack,” a song composed by his mentor Andrew Hill, in reverse. It seems to me that this provides the perfect metaphor for Moran and Glasper’s approach to music history: looking backward in order to move forward. As these two masters play in tandem, their collaboration takes on the quality of a dance: moving forward and back, side to side, across the space and history of the piano, and ultimately reaching what feels like consummation, only for us to be reminded that at some point it will end. We’re lucky to be invited to the dance party.